Two years after the very successful Seville conference, EuSalt decided to organize another conference related to biodiversity and economic activity! 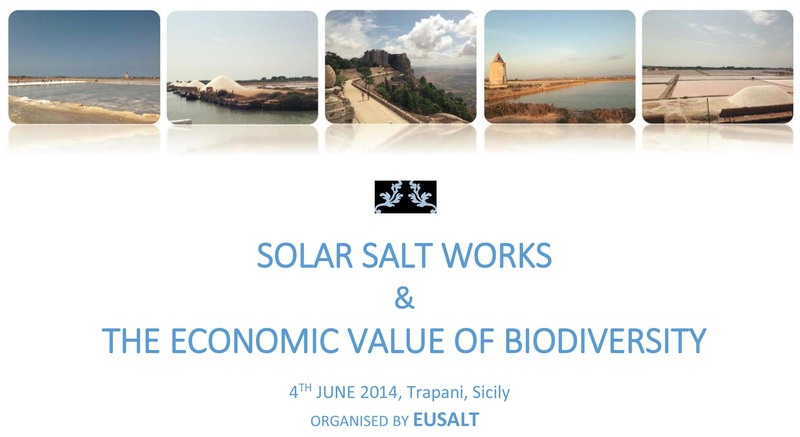 The international conference on “SOLAR SALTWORKS & the ECONOMIC VALUE of BIODIVERSITY” organized by EuSalt in Trapani, Sicily on June 14, 2014. Following the discussions and conclusions of Seville, the Trapani conference aimed to address issues related to biodiversity and economic activity. In Seville we concluded that solar saltworks and biodiversity preservation are inter-dependent and important for one another. Drawing from this, EuSalt now aims to identify the main challenges and opportunities facing solar saltworks when it comes to putting an economic value/price on biodiversity. It is also commonly agreed that solar saltworks are essential for preserving biodiversity and ecosystems that are specific to coastal areas and (inland) wetlands. In return, biodiversity that thrives on solar saltworks is an undeniable asset to salt production. While this interdependence is acknowledge and praised, the economic factor is sometimes missing. ♦ How do solar saltworks respond to those challenges? ♦ How do they reflect the economic value of biodiversity? ♦ How do they evaluate this economic value? ♦ How do they reconcile minimum economic needs and biodiversity “obligations”? You can download all presented papers and the full Book of Proceedings of the conference, here!